This latest report from Gartner evaluates products from leading Endpoint Protection vendors against the critical capabilities every business needs. A continuation of Gartner’s 2018 Magic Quadrant Endpoint Protection analysis, the report analyzes vendor capabilities in nine critical areas, including Prevention, Console Alerts and Responses, Core EDR Functionality, Third Party Integration and Managed Services (MSS/MDR). These are assessed against the requirements of three types of business, classified by use case according to their approach to endpoint protection. Which specific capabilities a business like yours is currently deriving the most value from, and how they’re addressing the adoption of technologies like EDR. 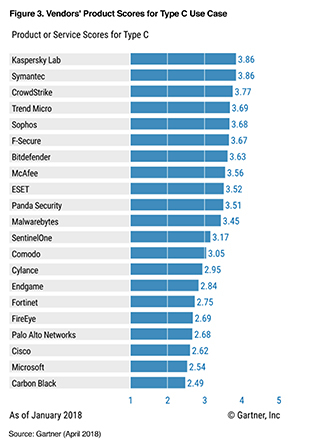 How EPP+EDR products from 21 leading vendors measure up the these expectations, and why Kaspersky Lab’s EPP solution appears in the Top Three for all three Use Cases. Consistently high performance in independent tests is the hallmark of Kaspersky Lab’s success. Find out why our vision of true cybersecurity means we have the critical capabilities your business needs today. Gartner does not endorse any vendor, product or service depicted in its research publications, and does not advise technology users to select only those vendors with the highest ratings or other designation. Gartner research publications consist of the opinions of Gartner's research organization and should not be construed as statements of fact. Gartner disclaims all warranties, expressed or implied, with respect to this research, including any warranties of merchantability or fitness for a particular purpose..